Electronic states are considered in a cylindrical quantum dot with the Kratzer confining potential in the axial direction. In this system, the nonlinear optical rectification and second harmonic generation for intraband transitions are studied theoretically. Analytical expressions are calculated for the energy spectrum of the wave functions, as well as for the matrix elements. The dependences of the coefficients of the optical rectification and the second harmonic on the incident photon energy are obtained. The nonmonotonic behavior of the dependences of the peaks heights of the optical rectification coefficients depending on the half width and depth of the Kratzer confining potential in the axial direction is demonstrated. Russian Text © D.A. Baghdasaryan, E.S. Hakobyan, D.B. Hayrapetyan, H.A. 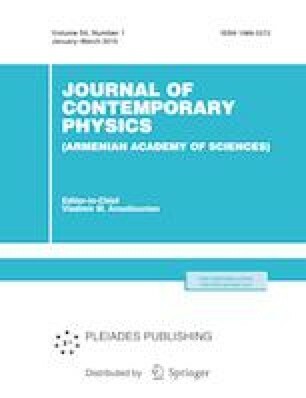 Sarkisyan, E.M. Kazaryan, 2019, published in Izvestiya Natsional'noi Akademii Nauk Armenii, Fizika, 2019, Vol. 54, No. 1, pp. 61–74.